Threaded flanges are generally used for galvanized and cast-iron piping. Threaded flanges are subject to the requirements for threaded joints in accordance with para. 314 of ASME B31.3. As per the requirements of this para., their use is not recommended for any service where crevice corrosion, severe erosion, or cyclic loading is likely to occur. When using threaded flange the bending stresses in the piping system should be carefully evaluated due to possibility of leakage through the threads. Threaded flanges are available up to class 2500 rating and can be used for high pressure service at ambient temperatures. The integrity of a threaded flange is less when compared to a weld-neck slip-on or socket weld flange. To prevent leakage through the threads a threaded flange may be seal welded. However, the seal weld is not considered to provide any strength to a threaded joint. As per ASME B31.3 if the pipe end projects through the flange face and serves as gasket seating surface, the use of threaded flanges may be limited only for Category D Fluid service. 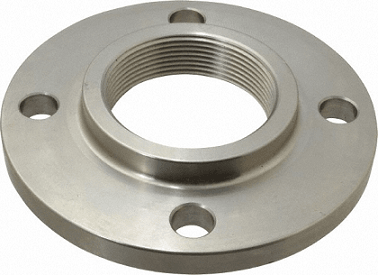 The threads of a threaded flange is required to be concentric with the axis of flange opening and variations in alignment with respect to the flange face shall not exceed 5mm/m as per the requirements of ASME B16.5 para 6.9.1. When threaded flanges are assembled with threaded-end pipe, the intent is for the end of the pipe be reasonably close to the mating surface of the flange. This is achievable in flanges up to class 400 rating. As stated in Appendix – I of ASME B16.5, the length of internal thread in Classes 150, 300, and 400 flanges conforms to ASME B1.20.1. This statement can be clarified with an example of 24-inch flange. As per Table-2 of ASME B1.20.1, the effective thread length (L2) for 24-inch pipe is 3.25” (83 mm). This dimension matches the minimum thread length (T) of 83 mm for 24” ASME B16.5 flange up to class 400 rating. However, for threaded flanges in Class 600 and higher ratings, the minimum thread length (T) through the hub of the flange exceeds the limitations of ASME B1.20.1. For example, as per Table 2 of ASME B1.20.1, the effective thread length (L2) for 24” pipe, which is 3.25” (83 mm) is less than the minimum thread length (T) of 93 mm for ASME B16.5 24-inch class 600 rated flange. Hence, to meet the intent of ASME B16.5, when using threaded flanges in Class 600 or higher, pipe wall thickness of schedule 80 or heavier is used, and the length of external effective thread on the pipe end is increased to value more than what is specified in ASME B1.20.1 so that the end of the pipe is reasonably close to the mating surface of the flange. Table I-1 of ASME B16.5 provides the required additional length of threading on the pipe for flanges above class 600. When installing threaded flanges Class 600 and higher, ASME B16.5 also recommends using power equipment to obtain the proper engagement to bring the pipe end close to the flange face. Dimensions of Class 150 RF Threaded Flanges as per ASME B16.5. Dimensions of Class 300 RF Threaded Flanges as per ASME B16.5. Dimensions of Class 600 RF Threaded Flanges as per ASME B16.5. Dimensions of Class 900 RF Threaded Flanges as per ASME B16.5. Dimensions of Class 1500 RF Threaded Flanges as per ASME B16.5. Dimensions of Class 2500 RF Threaded Flanges as per ASME B16.5.